Phrased as the "hit or be hit card game" this fun little card game is sure to keep you entertained and coming back for more. Hit The Deck is a strategic game mixed with a little bit of luck. Make sure to play your cards right or you might be hit by the deck and end up with way more cards than you wanted. Hit The Deck combines just enough strategy and fun to make it great for a variety of audiences. The rules are easy to read and make it quick to learn how to play. Portable and easy to take with you this game is perfect for vacations where ever you go. 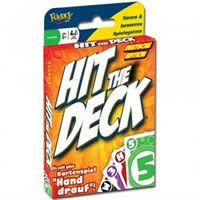 Grab your copy of Hit The Deck and let us know what you think about this card game below. Game ends when someone hits 100 points. If you have the lowest score then you'll win. Includes 108 cards and the official Hit The Deck game rules and instructions. Please keep in mind that the official Hit The Deck dice-card rules and instructions could be different depending on the game version you have. The rules below are some of the exact directions on how to play Hit The Deck. Share with us your comments, funny stories, tips, advice, strategies, creative ways to play, questions about how to play, problems with the rules or anything you want about Hit The Deck. All submissions will be reviewed within 24 hours. Click here to add your Hit The Deck comments.